The local University and shopping outlets are a couple of reasons why guests choose to stay at our comfortable, clean Georgetown, TX hotel. Whether guests are in town for a wedding or a graduation, its important to enjoy quality amenities at a competitive price. The local festivals and sporting events are what bring many guests to the region, but the Texas-sized hospitality of our staff members and well-appointed rooms are what make us stand out. A popular choice for family reunions and other special events, our Georgetown, TX hotel makes getting everyone together easy. Reunion Ranch is nearby, and our great location makes getting around town a breeze. Our cozy hotel is your home away from home, whether youre in town for pleasure or business. 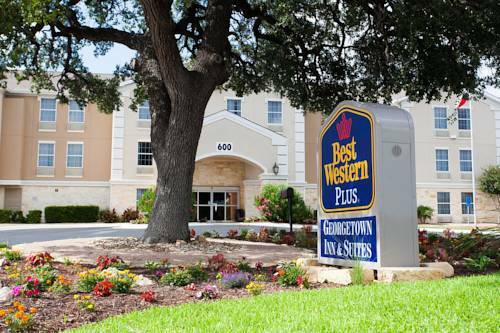 This Best Western Plus Georgetown Inn & Suites is a popular pick for business travelers in town for the DPS training facility, school sports or church conventions. When traveling as a group, price is critical. Guests enjoy a competitive price along with welcome touches of home, such as our famous complimentary full hot breakfast thats dished up daily. Hot eggs, breakfast meats and a wide selection of breads, fruit and cereals get your day started on the right side of bed. Top it off with our delectable 100% Arabica coffee and chilled juices. Its the most important meal of the day, and its on the house. From a convenient location to friendly staff members who are happy to offer recommendations, guests at our hotel in Georgetown, TX are treated like family. Lounge at the pool, or spend the day walking to the nearby shops and restaurants. Everything guests need for a memorable trip are available here. Reserve your well-appointed room at Best Western Plus Georgetown Inn & Suites and enjoy a peaceful escape! Enjoy your stay! �From: North. From Interstate 35, take exit 261 - follow frontage road to Highway 29, take loop around to northbound frontage road, turn right onto San Gabriel Village Boulevard and the Best Western Plus Georgetown Inn & Suites. �From: South. From Interstate 35, take exit 261A - turn right onto San Gabriel Village Boulevard and the Best Western Plus Georgetown Inn & Suites. Canoeing - 0.10 mile(s) from San Gabriel Park, lazy day of fishing, swimming, canoeing, festivals, concerts, games of touch football or Frisbee�, and family picnics. Camping - 5.00 mile(s) from Berry Springs Park, includes hiking, camping and fishing on over 300 acres. Boating - 7.00 mile(s) from Jim Hogg Park, visitors enjoy camping, fishing, boating, picnicking and all nature has to share. Billiards - 1.00 mile(s) from Mel's Lone Star Lanes, 40 lanes of bowling fun, party rooms, cafe, arcade, sports bar, billiards and shuffleboard tables. River - 0.10 mile(s) from Hike & Bike Trails, nine miles of hike and bike trails along the north and south San Gabriel river. Lake - 5.00 mile(s) from Lake Georgetown, 1,200 acre lake offers boating, skiing, fishing, four separate camping areas, a wildlife preserve and 16 miles of hiking trails. 0.04 mile(s) from The Square in Georgetown, historic downtown Georgetown - a wide variety of shops. 2.00 mile(s) from Fountainwood Observatory, viewing nights are free and open to public, on hand to guide viewing by Southwestern University Physics Department. Features a "Cooking with Dr Pepper" exhibit, and displays rare bottles of LBJ Vice-President soda, which were never sold because he unexpectedly was no longer Vice-President.